The Spotted Owl (Strix occidentalis) is 43 cm (17 inches), a wingspan of 114 cm (45 in), and a weight of around 600 g (21 oz). Its eggs are a little over 50 mm (2.0 in) long, and are white and smooth with a slightly grainy texture. 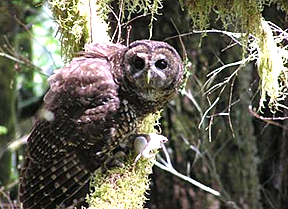 The secretive spotted owl lives in the ancient forests of the Pacific Northwest. They nest in large trees and fly under the forest canopy to hunt. The current population of the owl is 15,000 individuals. The dwindling numbers of this shy and speckled bird are an indicator of the declining health of the old-growth forests. The logging of the gigantic trees in the ancient forests in the region has severely fragmented their habitat.